… changed my email signature to include a message about my Marketing One Year program. It’s fairly subtle, but it appears on the bottom of every email I send. An easy way to keep the program top of mind with the people I know – and the people with whom they may share it. 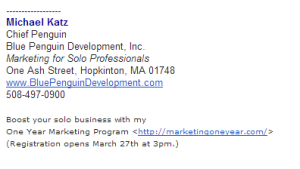 When was the last time you updated your email signature? Been thinking a lot about email signatures. I am launching my new “Tourist Content” concept on 4/1, so every little angle of communication has been scrutinized. I’m just wondering if these long email signatures work any longer. Like who really reads them. Who needs to know that much info on each email. And, do they muddy up what you are trying to promote. One of the issues I have with long signatures is how they add so much redundant garbage to email threads. If you absolutely felt like you needed to include contact info, you could but another link that takes them to your site’s “contact” page. That’s a great question and I don’t really know the answer on how much people read these. I think they do have utility in that I often go to an email to grab someone’s phone number or URL, so it’s kind of a convenience. Not sure though if, as you point out, it’s so noisy that nobody notices any of it!